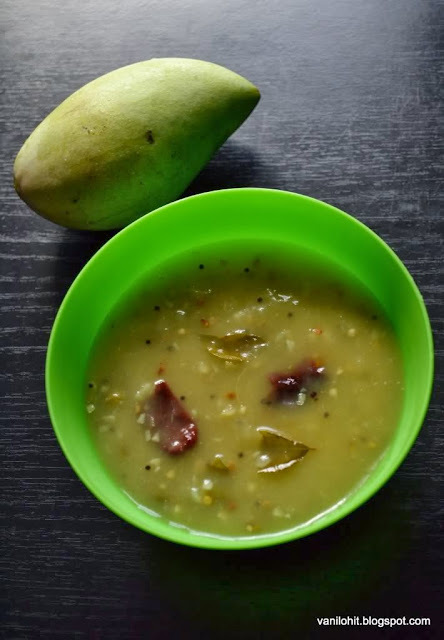 This is one of the authentic recipes of Malnad region. Everybody knows that the orange peel is used for face pack. 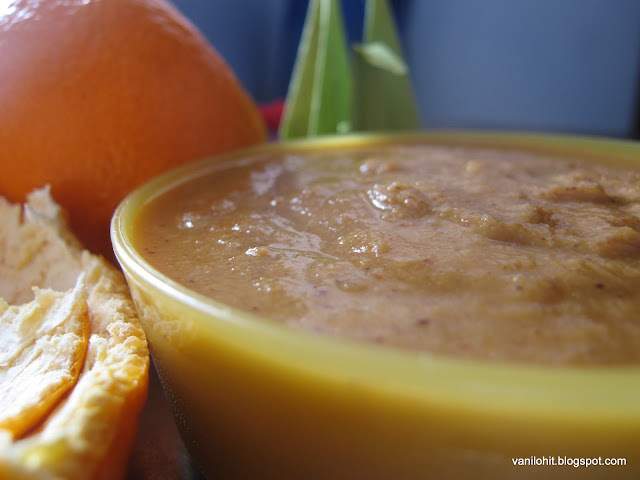 using the same orange peel, wonderful Gojju can be prepared very easily! Taste of this gojju will be little sweetish with the hint of spice and tanjiness. Nice flavor of orange will enhance the taste of the gojju. This can be had as a side dish with rice. Heat around 1 cup of water and bring to boil. Put the orange peel in the boiling water and cook for 5 minutes. Squeeze off the water from the peel and keep aside. Heat oil and add red chilli pieces, urad dal, mustard seeds, sesame seeds and asafoetida. Fry them nicely and grind them along with orange peel, tamarind and grated coconut into the consistency of Chutney. Add salt and jaggery to the ground paste and boil it for 5 minutes. It can be used for 2 days if kept outside the fridge. You can preserve this gojju in the fridge for a week. Once we hear the word 'Chakkuli', first thing that comes to our mind is Ganesh Chaturthi. My mom and aunts used to prepare Chakkuli in lots and we were enjoying eating them up-to months! There is a tradition in my native that all the ladies will visit their mom's place with their hubby after the festival and give mom 'Baagina'. It consists of some holy items for ladies like- bangles, kunkum and turmeric, blouse piece or saree, etc. There is a belief that it is good for the daughter to prepare the Baagina on Ganesh Chaturthi and give to her mom and get her blessings. So, every daughter will visit her mom's house after the festival. Chakkuli, Vade, etc. dishes prepared for the festival and will be served to all these guests. 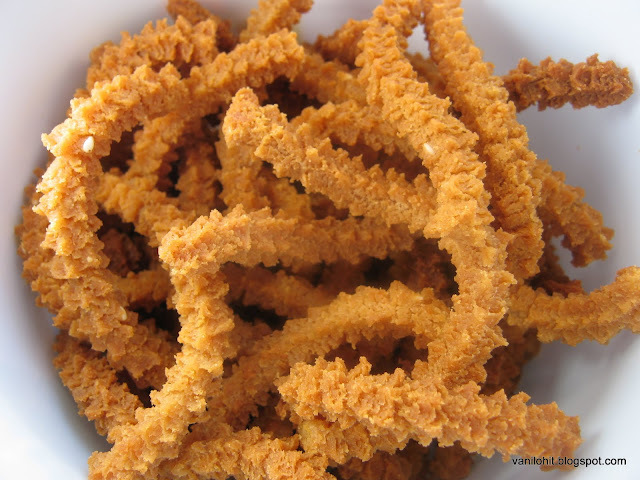 Coming to the recipe, Chakkuli muruku will be more crispier than the Chakkuli, which will be prepared as snacks for day to day use. It is very popular in Tamil Nadu state of India. Because of its taste, you can't stop yourself once you start eating them! Mix all the flours, red chilli powder, salt, sesame seeds and cooking soda in a mixing bowl. Heat the butter and pour it on the flour mixture. Mix it well and add water little by little. Knead it well and prepare a smooth dough. Grease the Chakli mould and fill it with the dough prepared. Heat oil in a frying pan. Once the oil is nicely hot, start pressing the dough into the hot oil with Chakli mould. Cook the muruku on medium heat till the become nicely crispy. If the flame is too high, it won't get cooked well. 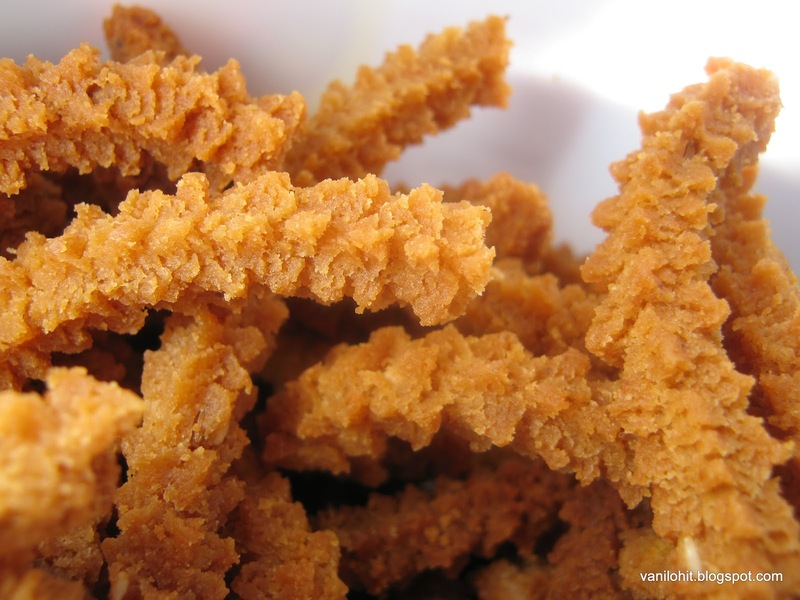 Keep the deep fried muruku on a tissue paper to absorb excess oil. Once it is cool, transfer the chakkuli muruku to an airtight container. It goes well with a cup of hot tea. Don't add too much of butter for preparing the dough. Else, muruku will become too crispy and you may not be able to get the perfect muruku shape. This recipe was published in Thatskannada Newspaper, from my Kannada blog on 31th May 2011. Thanks to Thatskannada! This is slightly different from regular lemon rice. 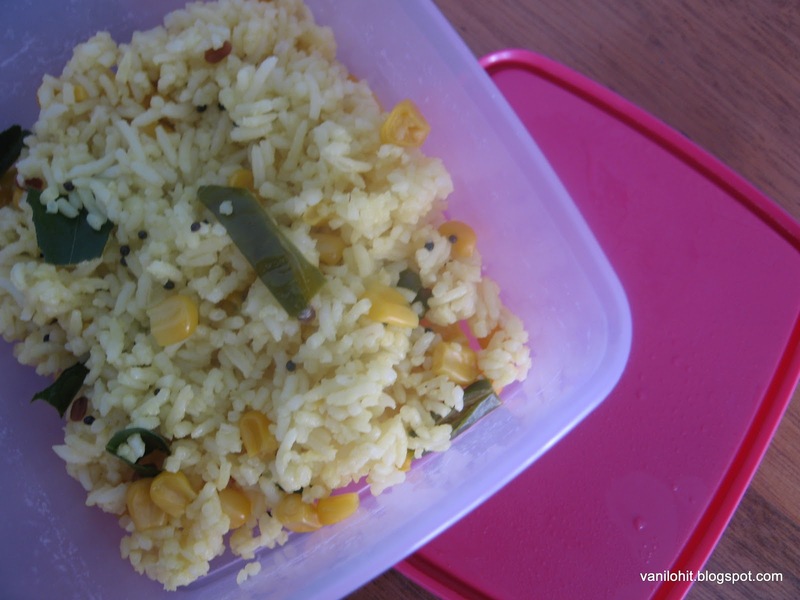 This colorful lemon rice with sweetcorn looks very nice and attractive (not as in the below pick! I couldn't take a good pick this time :( ) Especially, children will love it a lot :) I tasted this kind of lemon rice for the first time at my sister-in law's place and liked it a lot. I learned it from her and it has become a common lunch box item at my home these days. Wash the rice thoroughly and cook them. Don't make it too smooth and sticky. Spread the cooked rice on a wide plate and allow to cool. Heat oil in a frying pan, add urad dal, mustard seeds and asafoetida. Once the mustard seeds start spluttering, add turmeric, green chillies and curry leaves. Add sweet corn and cook it for 2 - 3 minutes. To this, add rice and mix it little-bit. Add salt, sugar and lime squeeze and mix it well. Check and adjust the taste. 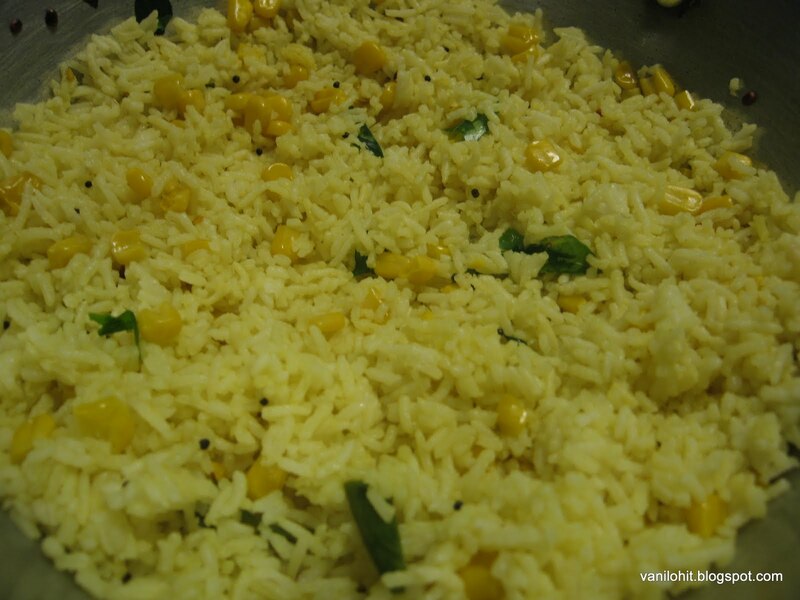 Lemon rice with sweet corn is ready to serve. In India, Kheer / Payasam is mainly meant for serving to the God. Also, its very convenient to prepare Kheer when you want to prepare some sweet dish in less time. Main ingredients needed for any kind of Kheer are - milk and sugar / jaggery. Different varieties of Kheer are prepared by adding other thing with these main ingredients. When we were in Bangalore, I was getting nice bottle gourd from 'Reliance Fresh' almost throughout the year. I used to prepare Bottle-gourd Kheer frequently. 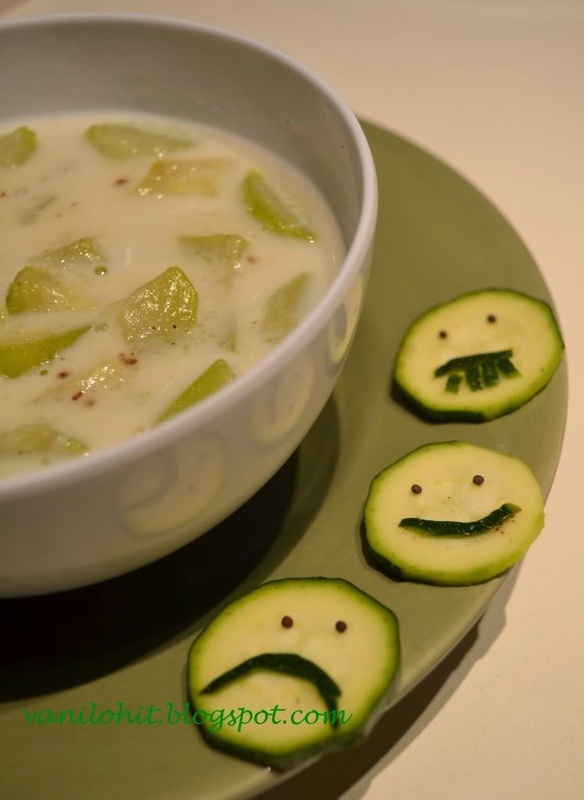 After coming to Australia, I tried preparing same kind of Kheer using Zucchini. To our surprise, it resembled the same taste of Bottle-gourd Kheer! These days, I never look for bottle-gourd in the shops; we got used to the taste of zucchini itself! This delicious dessert can be prepared very quickly. If you like a sweet side dish, it goes well with Tellevu also! Peel the zucchini and cut into medium size cubes. Add water to chopped zucchini and bring to boil. Once the zucchini cubes are half cooked, add milk, sugar and pinch of salt. Wash the semolina and drain all the water. Add this to the boiling Kheer and mix it well so that no lumps are formed. 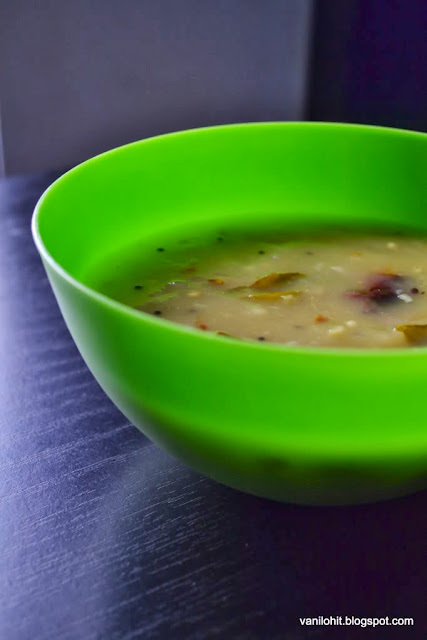 Boil this Kheer for 6 - 7 minutes. If you wish, add few strands of saffron while boiling. This will give a nice aroma and color to the Kheer. Powder the cardamom seeds and cloves finely. Before switching off the flame, add the powdered cardamom and cloves and stir it once. Serve the Kheer hot or cold. For garnishing, you can you some dry fruits if you want. 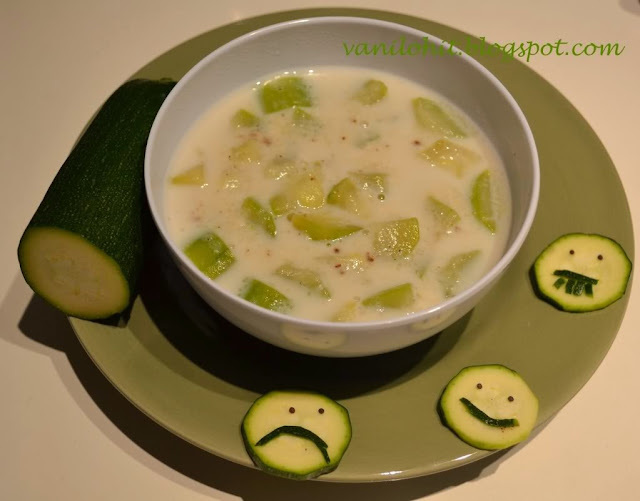 Same way, you can prepare Kheer with bottle-gourd also. Semolina will thicken the consistency. If you want the Kheer to be more thicker, increase the quantity of semolina. 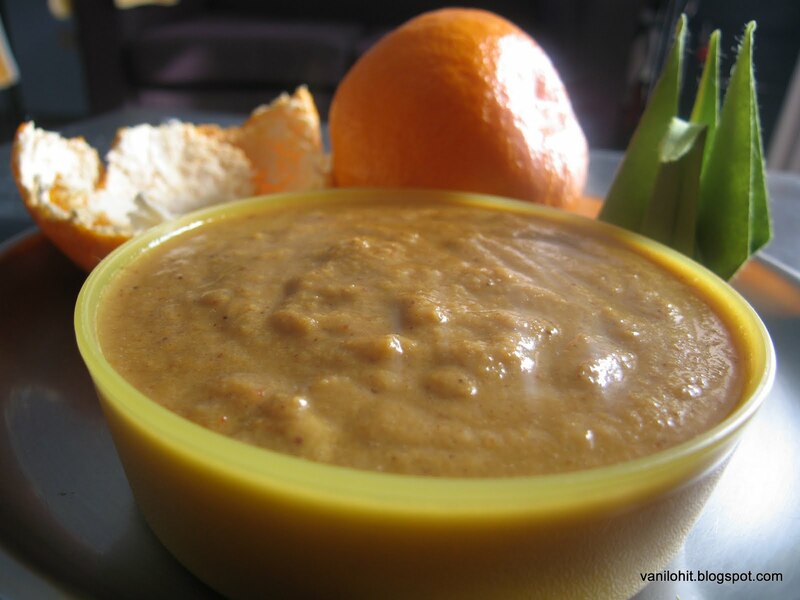 Adding 1 - 2 spoons of jaggery along with sugar will give a nice taste to this Kheer. Sending my entry to Celebrate Sweets | September 2011 - Sweets / Desserts With Fruits & Vegetables @ Rak's Kitchen, which was started by Nivedita. 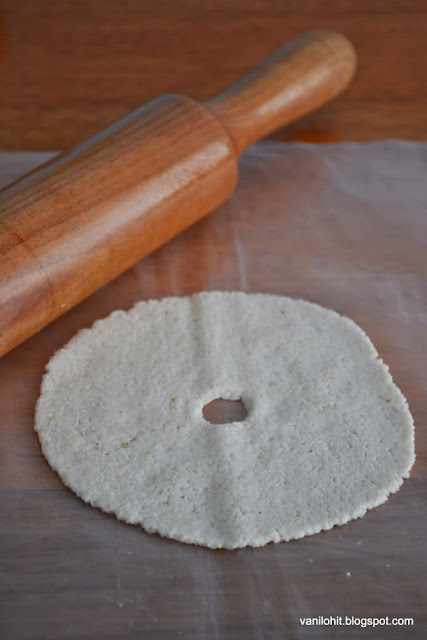 If you go to any Havyaka home in North Kanara, you will find a kind of paper like thin dosa for the breakfast. That is Tellevu! Tellevu is one of the special food of Havyakas. 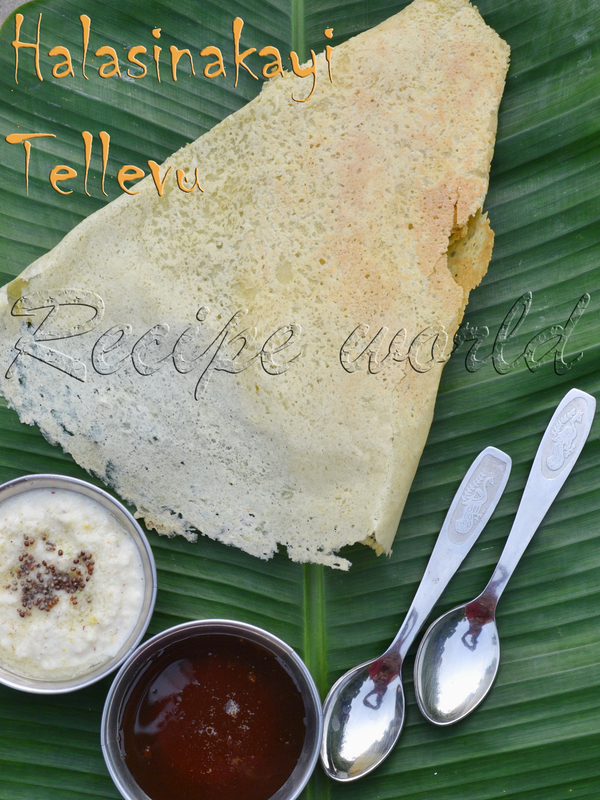 Preparing Tellevu is really an art; once the batter is poured onto the hot dosa pan, it should be spread very quickly. Else, the batter will get cooked and you can't spread it thinly. A waste credit card or a plastic playing card will be useful to spread the batter on the dosa pan. In my native, they will use the folded Banana leaf to spread the batter. But this is not going to be a better idea for people living in cities! Soak rice, urad dal and fenugreek seeds in water for 4 - 5 hours. Peel the cucumber and chop them. Grind the chopped cucumber along with soaked ingredients and prepare a fine dosa batter. Water content in the cucumber will be sufficient to prepare the batter. If required, add little more water. Keep the tellevu batter in a warm place for 7 - 8 hours or overnight. Heat the dosa pan and apply very little oil. For preparing each dosa, you need to apply 2 - 3 drops of oil to avoid sticking it to the pan. Add salt and sugar to the tellevu batter and mix well. 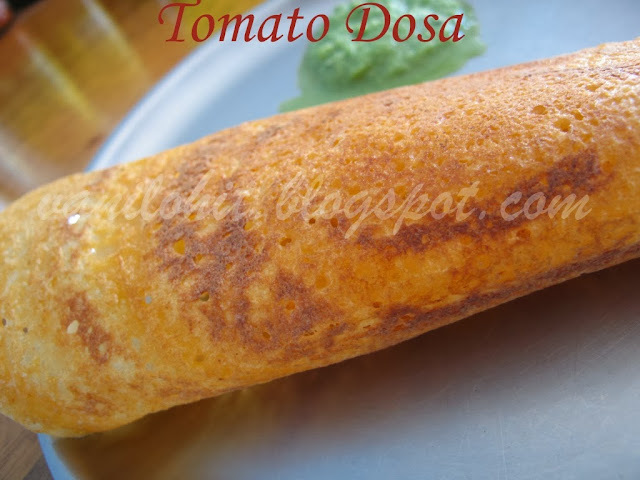 Take one ladle full of batter and pour it onto the hot dosa pan. Spread the batter quickly using the plastic card very thinly. Once it is done, start from the edges and remove it off. Serve the hot Tellevu with any kind of chutney or other side dish. 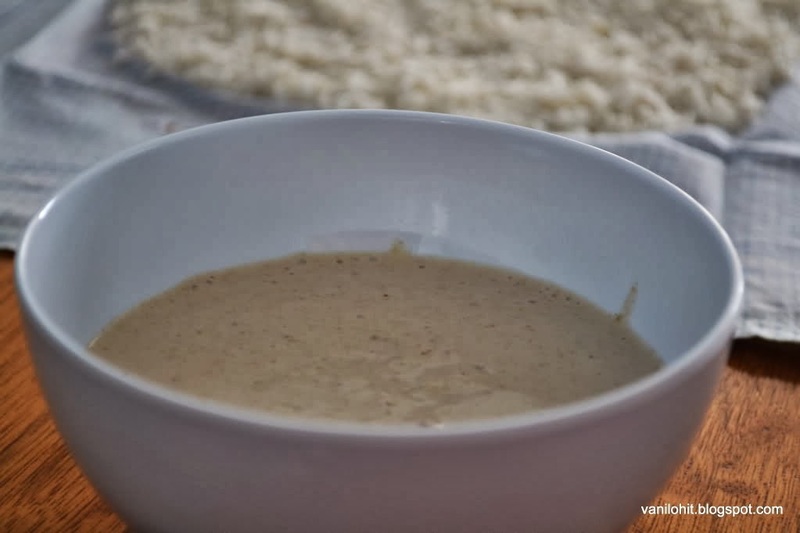 For Tellevu demo, check out the below video clip..
For preparing the tellevu batter, you can also use yellow cucumber or zucchini instead of cucumber. If not using any of these veggies, just increase the quantity of urad dal to 1/2 cup instead of 1/4th cup. If you like crispy Tellevu, you can roast it littlebit. If you want a smooth one, take it out little early. For good results, keep the dosa pan covered with cold water for 8 - 10 hours before preparing any kind of dosa / Tellevu. Set dosa is my all time favorite. Whenever some guests are coming to our home, I will be in a confusion about the food menu. Most of the times, I will prepare Set dosa for the breakfast. Its for the simple reason that, set dosa will come out nicely all the time. Totally, there be Zero risk if I opt for this dosa! 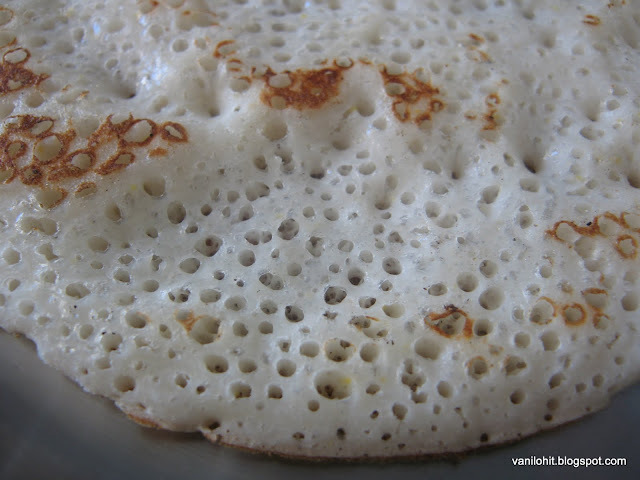 For set dosa to come out well, batter need to be kept in a warm place for fermentation. During winter time, fermentation will be bit difficult. What I do during such times is, I will cover the vessel with batter with one more slightly bigger vessel. This will help to maintain the warmth to some extent. If you have a microwave oven, you can heat it little-bit and keep the batter inside the oven for fermentation. Soak rice, urad dal and fenugreek seeds in water for 5 - 6 hours. Grind the soaked ingredients along with flattened rice / cooked rice and prepare the dosa batter. You can use some water while grinding. Keep the batter in a warm place for 7 - 8 hours for fermentation. Add salt and sugar to the batter and mix well. Heat the dosa pan and apply little oil. Take a ladle full of batter and pour it on the pan. 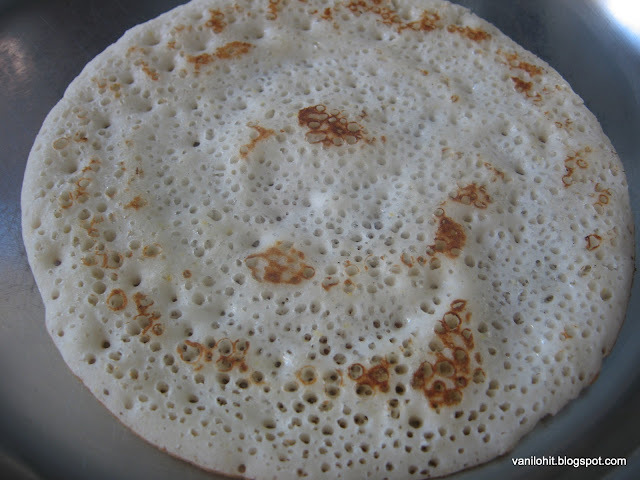 Spread it little-bit and prepare a thick dosa. Add few drops of oil or ghee while cooking the dosa. Cook the dosa on both the sides and serve hot with Chutney. If you won't have sufficient time to soak the ingredients, you can soak them in hot water for around 3 hours. 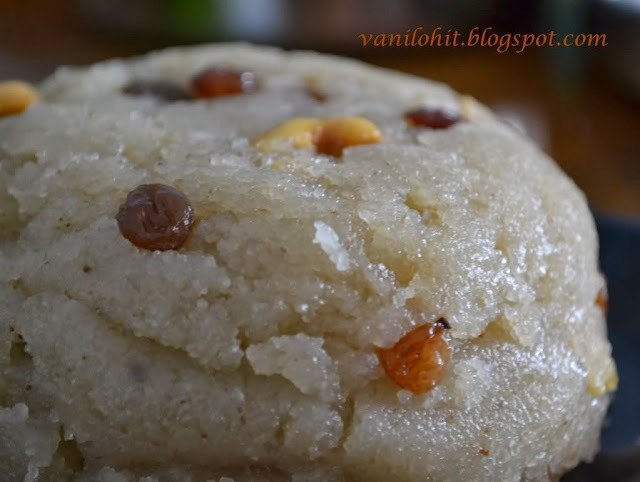 Rava Kesari or Shira is a common sweet dish in all parts of India. Most of the people prefer this for entertaining the unexpected guests Because it is simple to prepare and great to serve! 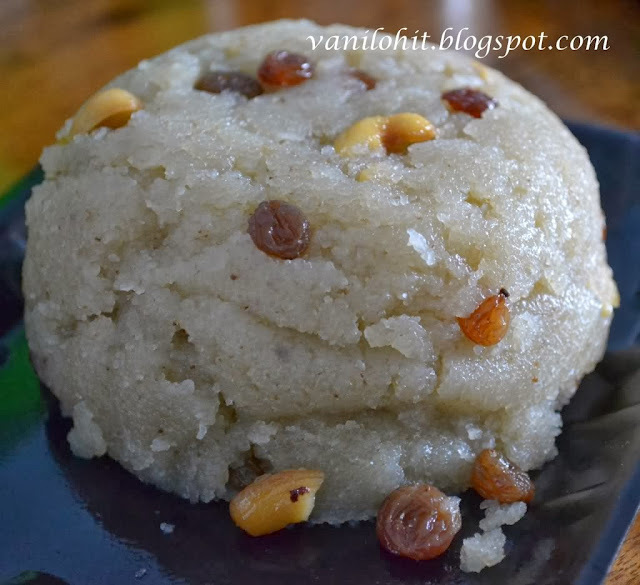 This kind of Kesari can be prepared using the wheat flour also. I always prefer Semolina Kesari than wheat flour one. I prepared it last month to entertain the guests. It was a long time since we have eaten this Kesari and we enjoyed eating this delicious sweet. Heat half the ghee in a pan. Add semolina to the pan and roast until golden brown or until you get the nice aroma. Heat the oil in a vessel and it should be nicely hot (or boiling) by the time semolina is roasted. Add the boiling water to the roasted semolina and mix well. Add pinch of salt and close the lid. Open the lid after 5 - 6 minutes and check whether the semolina is cooked nicely. Take a little-bit quantity and check it with your fingers. If needed, add little more water and close the lid for few more minutes. Once all the water is absorbed and semolina is cooked, add sugar. Again, it will become little bit watery when you add the sugar. Cook it for 7 - 8 minutes. Check the sweetness and add some more if needed. Add saffron strands or food color if you wish. Roast the cashews and raisins with ghee and add the same to the Kesari mixture. 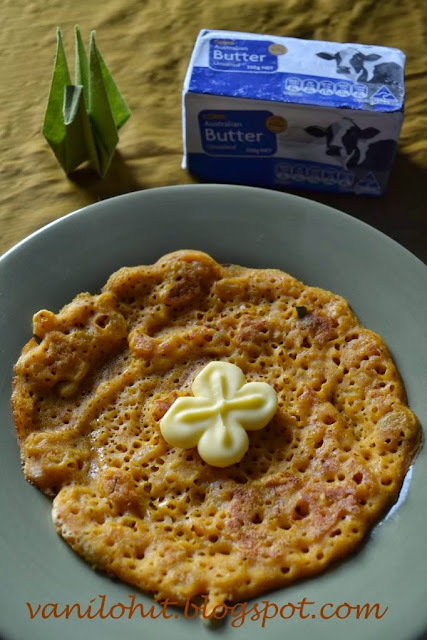 Add milk and little more ghee and cook it for 8 - 10 minutes in low flame. Right consistency is when the ghee starts separating from the mixture. Add the cardamom powder and switch off the flame. Serve this delicious sweet wish some spicy snacks! We always prefer some or the other kind of dosa for the daily breakfast. 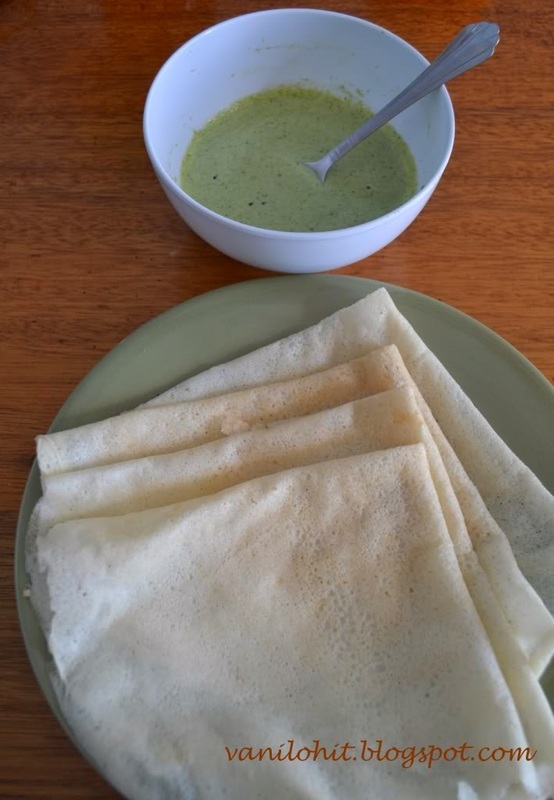 Sometimes, I prepare rotti or idli also, but most of the days, our day starts with dosa! Here, we get a vegetable called Zucchini. It looks like cucumber, but tastes like bottle-gourd! Sometime back, we had been to a Farmers market nearby and bought this vegetable from the market. Somehow, I was not able to finish it off and it started spoiling. I thought of using the zucchini for preparing the dosa batter. 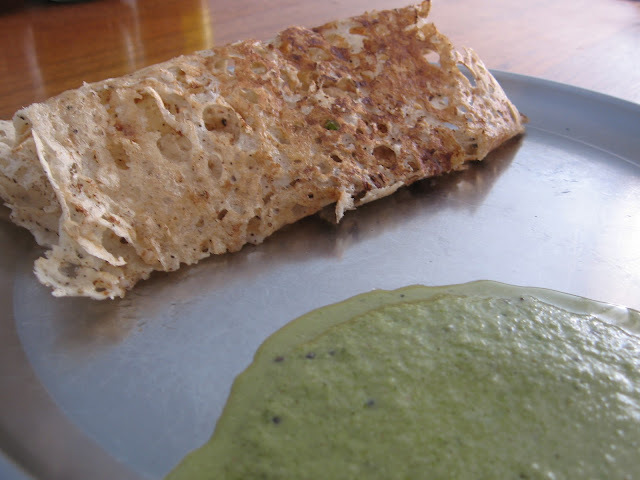 Dosas came out very well and we couldn't make it out that it is made of zucchini!! Then, the stock of zucchini got over very easily. 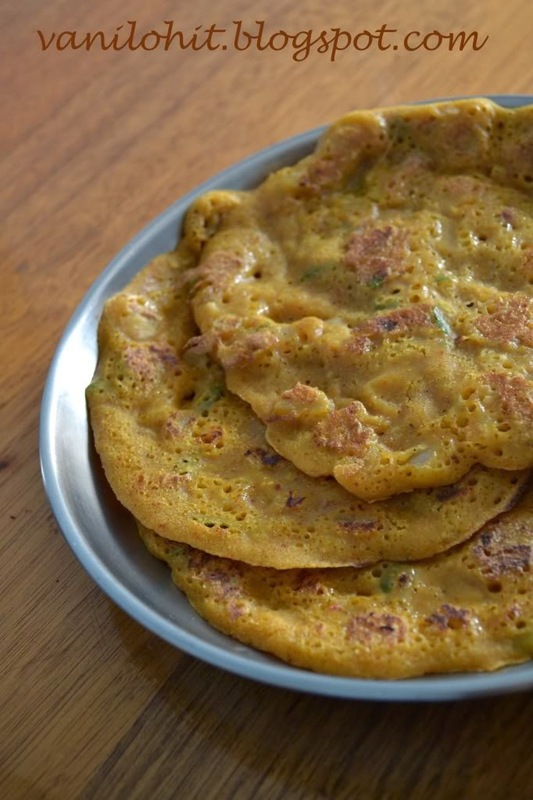 Last week I tried preparing Spicy Dosa or Khaara Dose, which I learned from my mom using the zucchini. It came out very well. I already prepared it three times using zucchini and we people enjoyed it a lot. Now, I am sharing this recipe with you as well! Zucchini is not a must, you can replace it with green cucumber or yellow cucumber. Soak the rice and fenugreek seeds in water for at-least 3 hours. Peel the zucchini and cut into small pieces or grate them using the grater or shredder. Combine the soaked rice and fenugreek seeds, chopped/ grated zucchini, red chillies, coriander seeds, cumin seeds, turmeric, carom seeds, mustard seeds, sesame seeds, asafoetida and curry leaves and grind into a smooth paste. You may need very less water for grinding them, because of the water content present in the zucchini/ cucumber. If required, add little water. Keep the batter in a warm place for 7 - 8 hours or overnight. Before preparing the dosa, chop the onion, mix it with salt and keep it for 10 - 15 minutes. If will make the onion pieces smooth and they will adjust with the batter nicely. Heat the dosa pan on medium flame. Add salt, sugar and chopped onion to the dosa batter and mix well. Pour a ladle full of batter on the dosa pan and spread it a little; don't make it too thin. Cook the dosa on both the sides. Add little oil or butter if you like. Serve the warm dosa with butter. 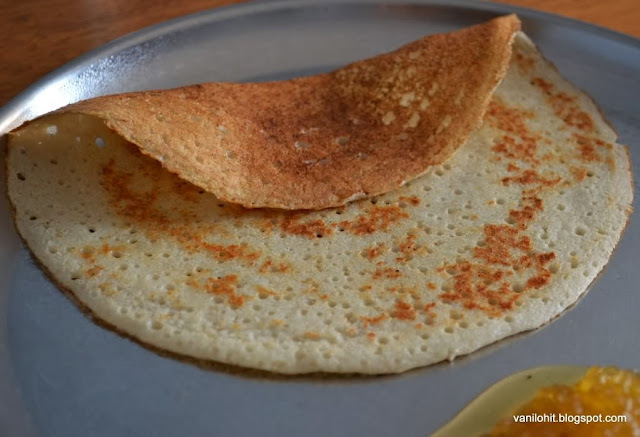 Add 2 spoons of grated coconut while grinding the ingredients to make the dosas very smooth. Vade is one of the authentic Havyaka delicacies, especially prepared for the Ganesh Chaturthi festival. 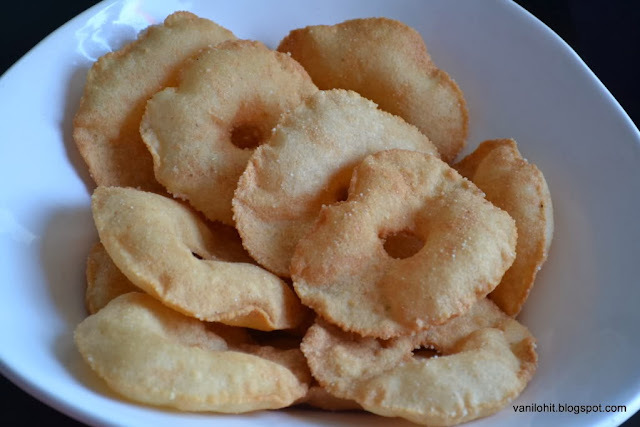 People will prepare Chakli and Vade in lots for this festival and enjoy them upto a month after the festival. This dish can be prepared with very less items which will be there in everybody's kitchen.. but it needs bit more time and little stressful job! Better to get a helping hand instead of doing it alone..
Soak urad dal and fenugreek seeds in water for 2 - 3 hours. Wash the rice thoroughly with enough water and spread them on a cotton cloth for 5 minutes to absorb the excess water. Powder them coarsely like sooji rava before it gets dried up. 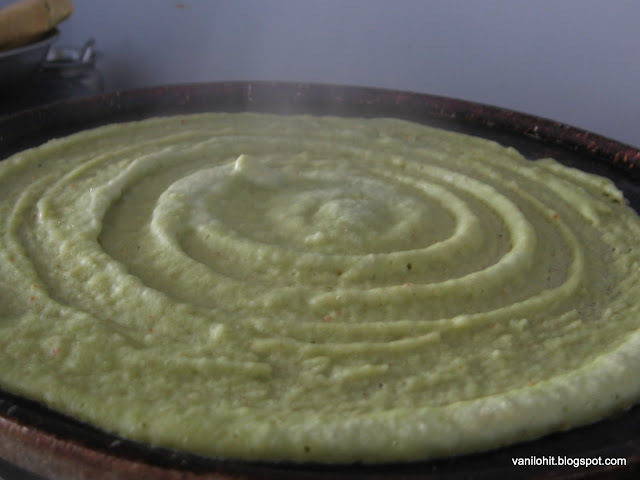 Grind the soaked urad dal and fenugreek seeds into smooth paste using water. Consistency of this paste should be the same as Dosa batter. Add the carom seeds, cumin seeds, sesame seeds and green chilli while grinding, or powder them separately and add to the batter. Don't use all the batter to prepare the dough; keep around 1/4th portion of the dough separately to add later. Now, take the batter, add salt and coarsely powdered rice little by little. Prepare a smooth dough like Chapati dough. Knead the dough nicely for at-least 8 - 10 minutes to ensure proper mixing. Keep the dough covered and let it sit for about 2 hours before preparing the Vade. After 2 hours, knead the dough again. If needed, add the urad dal batter which was kept aside. Heat the oil in a pan. Oil should be extremely hot (smoking level) for preparing the Vade; else, it won't puff up nicely. Take small lemon size dough and knead it nicely for a minute. Roll it into a small roundel like Poori on a greased plastic sheet. Make a hole in the middle. Once the oil becomes nicely hot, transfer the rolled Vade into the hot oil and deep fry till golden brown on both the sides. It won't take much time to deep fry them. Preserve the Vade in airtight containers and enjoy eating them upto a month! Don't keep the dough balls ready for longer time to avoid them getting dried up. Simultaneously, you need to prepare the dough balls, roll them and deep fry! That's why it will be better to have some helping hands. Sending this recipe to the 'Flavours of South India', ongoing event at Simply Food. Boondi Laddoo is a sweet variety which is popular throughout India. It is common to prepare these laddoos on festival and other occasions. 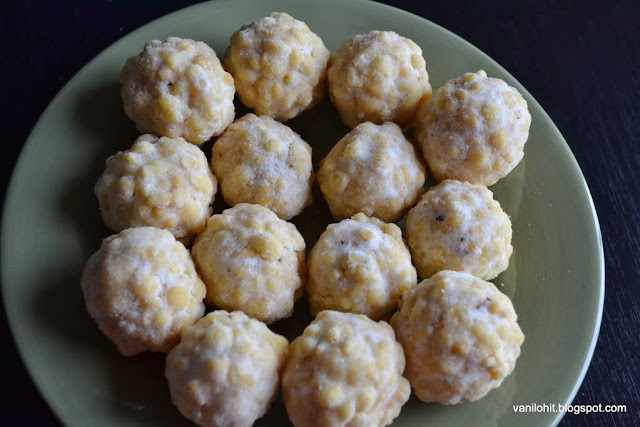 Boondi (small balls) will be prepared from the besan flour and laddoos are made by combining these boondis with sugar syrup; that's the reason its called as Boondi Laddoo! Take the besan flour, add water little by little and make a thick paste without lumps. Heat the oil in a pan on medium flame. Pour some batter on the ladle and let the drops of batter fall into the hot oil like tiny droplets. Deep fry the boondi, drain the excess oil and tranfer them to a vessel. Prepare a thick, 1 string consistency sugar syrup by adding little water to the sugar. Add the crushed cardamom seeds and cloves to the sugar syrup. Roast the dry fruits in ghee / oil and add to the sugar syrup. Add the boondi to the syrup and mix thoroughly. 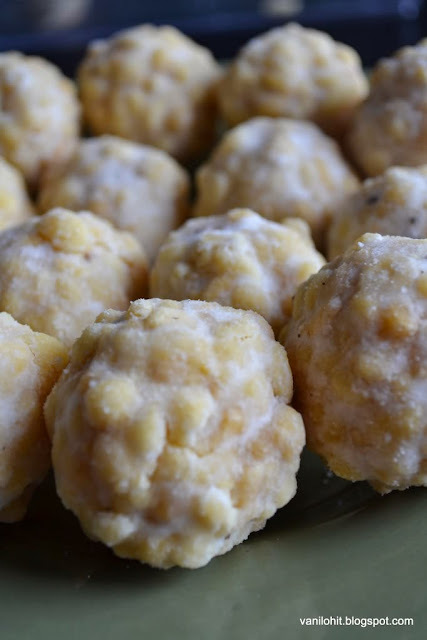 Laddoo should be prepared when the mixture is still warm. Take small portions of mixture and press then in between your hands to prepare the laddoos. If needed, you can warm up the mixture again and prepare the laddoos. These laddoos can be preserved upto a week. Add few strands of saffron to enhance the taste of the laddoo. If the batter to prepare the boondi is thick, just add little more water to adjust the consistency. 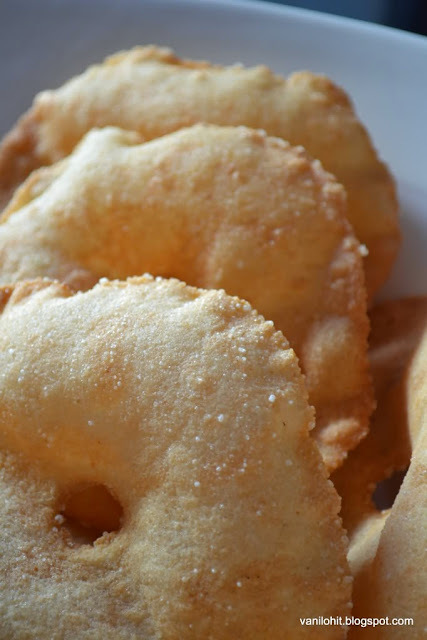 If it looks watery, try adding some dryflour. Food color can be added to make the Laddoo colorful. This Burfi is one of the special dishes which my Mom prepares. Using only 3 ingredients, this tasty and easy sweet can be prepared. 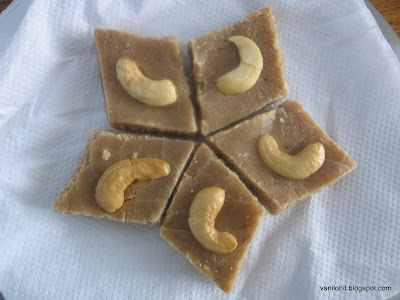 Whenever I prepare this Burfi at home, I will get over within one day! Dry roast the groundnut and remove the skin. Prepare a fine powder from the roasted groundnut. Take a thick bottom pan, pour the milk and sugar, and bring to boil. Once the sugar dissolves in milk, add the groundnut powder and mix well. Keep mixing the mixture till it thickens, separates from the bottom and reach the Burfi consistency. Pour it on a greased plate and spread nicely. You can use the rolling pin to spread it evenly. Cut it into desired shapes once it becomes cool. If you are confused about the right consistency for the Burfi, just put few drops of the Burfi mixture on the plate. If it becomes solid when it becomes cool, that's the right consistency! There is a big shopping complex in our area, which is at walkable distance from our house. Normally, we will go there frequently for our household needs. Last week, I had been there for browsing something and I found Totapuri mangoes in a shop there. I just rushed in and bought few mangoes with the idea of cutting and eating them. But it was too much tangy and I couldn't eat even a single pie! Then, I thought of preparing this Gojju (Thick gravy). More sour the mango is, its better for this Gojju. If boiled nicely, this can be preserved upto 4 - 5 days without refrigeration. Of course, you can use the mangoes preserved in salt water also instead of fresh ones. This gojju will be a good combination with rice. Cook the raw mango in water till it becomes smooth. After the mango is cooked, take it out from the water and allow to cool. Take out all the pulp from the cooked mango. Use some water if needed. Heat the oil in a pan. Add the red chilli pieces, urad dal, mustard seeds, asafoetida and turmeric. Once it splutters, add curry leaves and sliced green chillies. Add the crushed garlic and saute for a while to remove the raw smell. Add the mango pulp, sugar and salt. If it looks too thick, add some water to dilute it. Boil the gojju at-least for 8 - 10 minutes and switch off the flame. Store it in an airtight bottle once it becomes cool. Enjoy the hot and sour Gojju with rice. 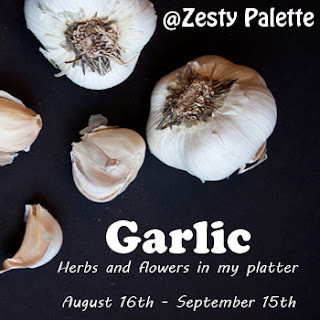 If you want to have more aroma of garlic, just skip adding garlic while preparing the Gojju; and once the Gojju is done, do the tempering with garlic. No need to boil the mangoes if raw mangoes preserved in salt water are used. Because, they will be boiled before preserving in salt water. This is my entry to the Event 'Herbs and Flowers - Garlic' hosted by Vardhini, which was started by PJ. Also, sending this to 'Flavours of South India', ongoing event at Simply Food.